This figure first appeared on the Return Of The Jedi 65 back card. Due to Lucasfilm?s desire to keep the Ewoks? appearance a secret, the Return Of The Jedi 65A card backs had both this figure and Logray blacked out. Despite this, Chief Chirpa was still released on the Return Of The Jedi 65A card. Comments: The vintage Chief Chirpa figure, being a little less distinctive than his Ewok companion that shipped on the Return Of The Jedi 65 back card, served as the first example of Kenner?s ingenious new form of army building. 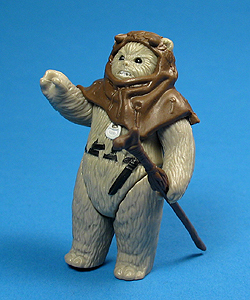 Unlike other figures in the vintage line, this little guy sported a removable hood, and even though it seemed like nothing more than a little added detail, which, once additional Ewoks were added to the line, became a way of creating a huge army simply by switching the hoods and accessories. When all is said and done, that?s something 2048 possible combinations! Major Variations: Though all vintage figures have minor variations, the Chief Chirpa did have one major production variation. Where the vast majority of Chief Chirpa figures are moulded in a light gray plastic, a small amount were produced in off white plastic. For the most part the white versions had turned up in early 1983 as prizes for a UK national newspaper?s contest. The contest winners received the figures in sealed Made In Hong Kong Kenner baggies and were accompanied with a light brown pointed-bottom staff. This wasn?t the only way to find this colour however, as it has been found on both Hong Kong produced Palitoy cards and Macau** produced Meccano cards. Thus far all examples found of the carded Honk Kong version sport a different COO* stamp than the bagged prize figure, and was packed with a dark brown round-bottom staff. The Macau version was similar to the other two versions, but didn?t have a COO stamp. 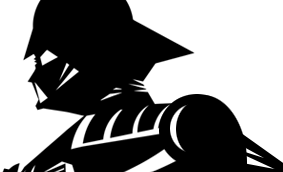 This version has only been documented being packed with a dark brown pointed-bottom staff. Even though all examples documented indicate that their accessories are unique based on where they were produce, there is no way to prove that to be the case. To date there have been no examples of the round-bottom staff shipped on North American card backs. ** Usually, the packaging and COO stamps for toys produced there are labeled ?Macau?, some packages and COO stamps use the French spelling ?Macao?.